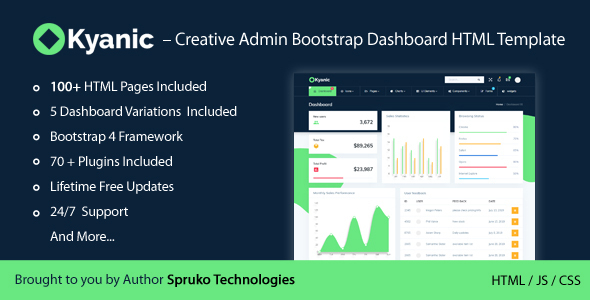 Kyanic– Creative Admin Multipurpose Responsive Bootstrap Dashboard HTML Template. This Template Includes 100+ HTML Pages & 70+ Plugins. It can be used for different various of 5 Dashboards Designs. It Includes Advanced Form Elements, Different Styles of Widgets etc.. It has super clean user interface, customizable components and widgets.The Template comes with a awesome unique design also we ensure you can easily design your admin pages.